USD/JPY has started the week on a backfoot, trades 0.26% lower on the day at 112.39 at the time of writing. The pair is extending weakness on the back of an unimpressive monthly employment report on Friday. Data showed that U.S. employers hired 155K workers in November, fewer than forecast, although the unemployment rate remained steady at 3.7% (at near a 49-year low). The poor result raises concerns that U.S. growth is moderating and the Federal Reserve may stop raising rates sooner than previously thought. Also, the IMF Chief Economist Maurice Obstfeld said in an interview on Sunday, the US economic growth is likely to slowdown in the coming years. March 1st 'hard deadline' for China trade deal set by the U.S. could make investors even more nervous than they already are. Technical bias is also bearish. Price has dipped below cloud and is on track for further downside. 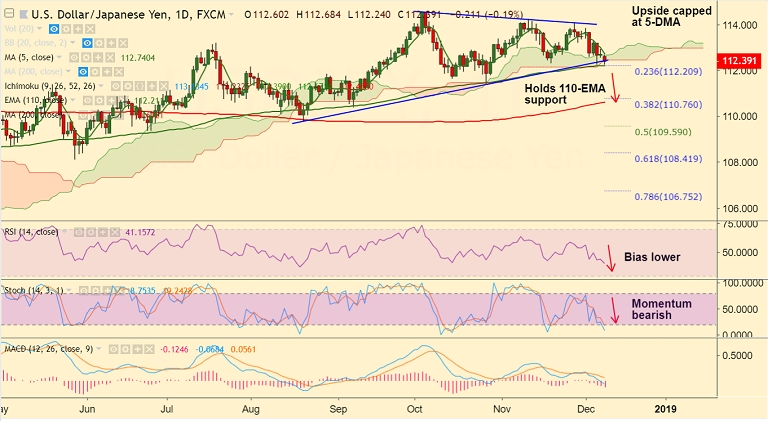 The Pair finds strong support at 112.20 (nearly converged 110-EMA and 23.6% Fib). Break below to see further weakness. On the flipside, 5-DMA is immediate resistance is seen at 5-DMA at 112.75. Break above to see minor upside.